This image was slated for a promotional postcard. Just imagine getting this in the mail! 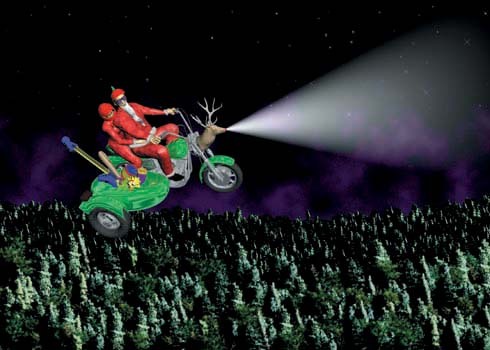 There's Santa and his "old lady" riding a Harley through the air. The ever-faithful Rudolph has been reduced to trophy status, his famous nose nevertheless lighting the way. Is that little Maggie from the Simpsons riding in the sidecar with the presents? Poor kid. She's probably hoping she won't wind up like Rudolph. Ah, there's some nightmare material for the kiddos! Let's take a closer look. Is that a tiny Christmas tree on Santa's head? Yes. Yes, it is. Here's a closer view of Rudolph. Egad. Poor fellow!